Although, the best way for INNEnglish to assess your English speaking skills is by a personal interview that is either face to face or on the phone, it is also recommended to complete a level test to determine your starting level. Please click on one of the following links below to test yourself. Choose the level you think you are and complete the test. The Common European Framework (CEF) is a system of level indicators for language courses that is used throughout Europe. 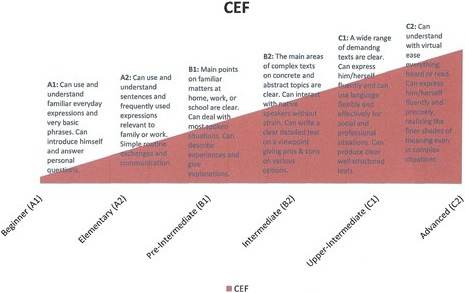 Each language course is described on the basis of CEF levels so that the students can clearly see which level of proficiency is required at the beginning of the course, and what skills are successfully acquired after completion.